Dates back to early 18th century, Bohri Ali is perhaps one of the busiest and most colorful lanes on Raviwar Peth. 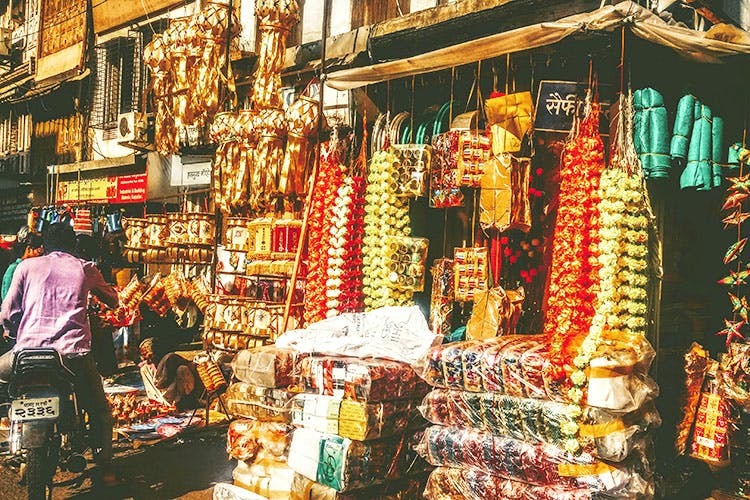 Retaining the old-school Poona charm for generations, the lanes and by-lanes of Bohri Ali are a treasure trove for all your DIY needs- from industrial paints to home decor, antiques, hardware supplies and much more. We spent nearly three hours exploring Bohri Ali in and out. Our conclusion? This lane has an abundance supply of paints and hardware supplies at a wholesale price. The quaint little stores, lined up on either side of road have been there for over five generations. We found everything from spray to industrial, artist and exterior paints, wood finishes, microfine paper, ropes, pipe fittings, tack cloth, hardware kits, construction tools, furniture fittings and more, starting at INR 250. We recommend you check out these old stores at Bohri Ali like General Hardware, Burban Trading Corporation and Master Hardware Store. Want to avoid the hustle-bustle? Buy your DIY kits from the official Bohri Ali website. #LBBTip: Why spend money on car-washing/polishing when you can do it yourself. How you ask? Check it out here. Festive season is upon us, which means Bohri Ali is all decked up with decorative lights. Starting at INR 40, get your hands on pretty fairy lights, earthen lamps, Chinese paper lanterns in vibrant hues and quirky shapes, magnificent kandeels and much more. Need lights for your home and workspace? Head to Bohri Ali for bulbs, flashlights, flexi strips, headlights and downlighters, starting at INR 120. Spending a lot of time on Pinterest on how to revamp your patio garden? Bohri Ali is your one-stop solution. Head to the 70-year-old store, AV Garden Tools at Bohri Ali and find amazing stuff, ranging between INR 10 and INR 10,000. We found the cutest collection of hanging pots, water cans, colourful pebbles for aquarium and terrariums and colourful succulent plants. They also keep soils like sphagnum peat moss for your dish gardens, cactus, exotic stones and fish food. The street shops and handcarts at Bohri Ali sell the most extraordinary pieces of home decor. From antique table watches to artsy wired showpieces in bird and cycle designs. Priced between INR 50 and INR 500, the tall artificial flower bouquets are a must for that Instagram-worthy living room. What’s more? Brighten up your bedroom with earthen and embroidered wall hangings, starting at INR 25. Handcrafted envelopes, gifting bags and boxes, crayons, paints, canvas, geometry boxes, engineering kits, sequins, glitters, sparkles, ribbons and LOADS more. The line of shops right at the start of Bohri Ali will end all your stationery woes at throwaway prices. Now this is a special mention. We found a shop – Kurbanhussain Chandabhai at Bohri Ali that sells hardbound red ledger books of all sizes, starting at INR 100. Shopping at Bohri Ali is not a cakewalk! If you love to explore old city lanes, this place is no less than a paradise. But if you aren’t a fan of crowded streets and honking cars, we recommend you buy your stuff from the official website of Bohri Ali here. Also, don’t forget to follow them on Facebook.